Welcome to the Inclusive Growth Bulletin, the monthly newsletter of the International Policy Centre for Inclusive Growth (IPC-IG). In this March edition, we are glad to celebrate International Women's Day with a special issue of the Policy in Focus magazine: “Women at work:addressing the gaps”, as well as publications on women's economic empowerment and on the debate on taxing large fortunes. We also bring you news and updates regarding the Centre’s policy dialogue activities, including participation in events. We hope you enjoy your reading! 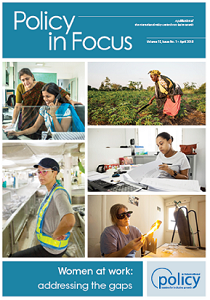 In celebration of International Women's Day, we are glad to bring you a new special issue of the Centre's flagship publication, the Policy in Focus magazine, titled “Women at work: addressing the gaps”. Presented by specialist guest editors Carolina Robino (Canadian International Development Research Centre—IDRC) and Raquel Tebaldi (IPC-IG), it features 15 compelling articles by leading academics, policy specialists and practitioners. This publication addresses a crucial aspect of women’s economic empowerment: labour market participation. Not all kinds of work entail positive outcomes for women, as they face challenges in pursuing well-paid, productive jobs that enable them to accumulate assets. Women’s time use will remain constrained if deeply rooted social norms, such as regarding housework and child-care responsibilities, are not shared by other household members. Read more here. This new issue is available as a free download in English, in PDF. In the Working Paper “Tax on Large Fortunes: the recent international debates and the situation in Brazil”, Pedro Carvalho Jr. (Institute for Applied Economic Research—Ipea) and Luana Passos (Universidade Federal Fluminense—UFF) provide an overview of wealth tax in Brazil and internationally. This paper comprises an updated and re-edited version of a Technical Note published in Portuguese by Ipea in 2011, entitled in Portuguese“As discussões sobre a regulamentação do Imposto sobre Grandes Fortunas: a situação no Brasil e a experiência internacional” (Discussions on the regulation of the Tax on Large Fortunes: the situation in Brazil and the international experience) (Carvalho Jr. 2011). This publication isavailable in English, and an accompanying One Pager is available in English and in Portuguese. The One Pager “Women’s economic empowerment programmes: towards a ‘double boon’ instead of drudgery and depletion”, by Deepta Chopra (Institute of Development Studies—IDS), presents the main outcomes of recent research carried out in India, Nepal, Tanzania and Rwanda under the framework of the Growth and Equal Opportunities for Women (GrOW) programme. It has highlighted the drudgery of both paid work and unpaid care work faced by women in poor families, leading to the depletion of their bodies and minds, and those of their families. This study is available in English and in Portuguese. The One Pager "Grievance mechanisms for social protection programmes: stumbling blocks and best practice", by Valentina Barca (Oxford Policy Management), is now available in Portuguese. This publication was previously released in English, French and Spanish. The One Pager “The unseen gender impact of conditionality: extra-official conditions”, by Tara Patricia Cookson (University of Cambridge), is now available in Spanish and in Portuguese. It was previously released in English and in French. Last, but no least, the One Pager "Gender-sensitive social protection in the Caribbean", by Raquel Tebaldi and Charlotte Bilo (IPC-IG), has been translated into French. It was previously released in English and in Portuguese. The French version of the socialprotection.org online platform has just been launched. This is yet another option to connect you with cross-cutting themes in social protection worldwide. We invite you to join the plataform socialprotection.org here. In March, as part of their knowledge-sharing agenda, our colleagues and partners at socialprotection.org will host three interesting webinars. On 22 March the webinar "Measuring gender outcomes in social protection programmes: Why is it important? How best to do it? "will discuss specific case studies from the World Bank’s review of impact evaluations of the Juntos cash transfer programme in Peru, and the Red UNIDOS programme in Colombia (register for free here). On 27 March the webinar "Social protection and the Changing Labour Market: Finding the Missing Links" will contribute to the debate on linking social protection to sustainable employment (register for free here). And on 29 March the webinar "How Can Social Protection Programmes Protect Women’s Right to Work?" will discuss labour-intensive employment, cash and asset transfer programmes in which the cultural and contextual meaning of gender roles and rights have enabled a more effective delivery of social protection (register for free here) . socialprotection.org is hosted by the IPC-IG. 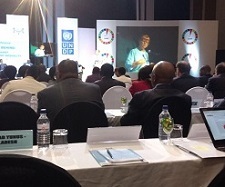 IPC-IG on the International Conference "Leave No One Behind"
The IPC-IG's is participating at the International conference "Leave No One Behind the Fight Against Poverty, Exclusion and Inequality", organized by the Government of Botswana and the UNDP, in Gaborone, on 20 and 21 March. This two-day conference addresses the 2030 Agenda for Sustainable Development Goals principle of Leave No One Behind, in recognition of the close linkages between poverty, exclusion and inequality. The conference is expected to produce key recommendations that will contribute towards the realisation of the principle of Leave No One Behind. IPC-IG's Senior Research Coordinator Rafael Osorio will deliver a presentation titled "Reforms and Social Protection in the Middle East and North Africa region". The presentation is in line with the Policy in Focus magazine title "Social Protection after the Arab Spring", recently launched by the Centre. The IPC-IG is attentive to the agenda of the 8th World Water Forum, which, for the first time since its creation in 1997, will be hosted in the Southern Hemisphere, in the Brazilian capital, Brasília—a city which has been dealing with a protracted water shortage crisis. Considering the inextricable link between water, the environment and sustainable development, we have gathered a selection of our recent publications surrounding these themes and related topics, such as agriculture, food security and urban planning. The Policy in Focus magazine—entitled “Public policies for the strengthening of family farming in the Global South”, eight articles draw attention to issues surrounding family farming in developing countries. Another issue of Policy in Focus, entitled “Food and nutrition security: towards the full realisation of human rights”, features 12 articles addressing the challenges involved in attaining the human right to adequate nutrition and food sovereignty in Brazil and in various African countries. The following issue, entitled “A new urban paradigm: pathways to sustainable development”, brings insights and innovative ways of thinking about the contemporary world and the new ‘urban era’, providing inputs for policy makers, practitioners and researchers to address new challenges related to sustainable urban development. Read more here. IPC-IG Research Associate and Ipea Researcher Daniel da Mata participated as a discussant of the paper "Of Cities and Slums", at the XXI 2018 Workshop in International Economics and Finance, held in Mexico City, on 12 and 13 March. The event was organised by the World Bank’s Office of the Chief Economist for Latin America and the Caribbean, the Inter-American Development Bank’s Research Department, Universidad Torcuato Di Tella, LACEA and the Central Bank of Mexico. IPC-IG's Senior Research Coordinator Fábio Veras and consultant Ryan Nehring participated in a learning needs assessment workshop, co-organised by the Food and Agriculture Organization of the United Nations (FAO) and the International Training Centre of the International Labour Organization (ITC-ILO), in Turin, from 26 to 28 February. They presented a white paper on rural poverty reduction that was discussed and further improved through a consultative process, which brought together researchers, practitioners, civil society and policymakers. Both the white paper and the needs assessment workshop are part of a joint project by the FAO, ITC/ILO and the IPC-IG to develop a comprehensive curriculum outline and content for an e-learning course on rural Poverty Reduction. IPC-IG Senior Research Coordinator Fábio Veras participated in the seminar Progresa-Oportunidades-Prospera—twenty years since its creation, organised by the Mexican National Council for the Evaluation of Social Development Policy (CONEVAL), in Mexico City, on 15 and 16 February. The event aimed at discussing the draft of a forthcoming publication that commemorates and takes stock of the 20 years of one of the most influential conditional cash transfers in the world. IPC-IG Research Associate and Ipea Researcher Sergei Soares and IPC-IG Consultant Carolina Bloch travelled to Rabat, Morocco, and to Tunis, Tunisia, from 19 February to 2 March 2018. In the Tunisian capital they met with official representatives from the Ministry of Social Affairs, the Ministry of Finance, the National Institute of Statistics, research centres and colleagues from UNICEF as part of a mission to implement a pilot project of a cash transfer targeting children. The pilot will consist of a universal cash transfer to all children up to 17 years of age, who live in the 12 less developed delegations of the country. This transfer will build on already existing interventions, such as the familyallowance for formal sector workers and the school allowance top-up (PPAS) for beneficiaries of Tunisia’s targeted social assistance cash transfer (PNAFN), who are guardians of school-age children. In Rabat, the Centre's delegation held meetings with colleagues from UNICEF. IPC-IG's Senior Research Coordinator Fábio Veras joined a mission to Morocco from 21 to 23 February, organised by the FAO, to meet with government officials in charge of rural poverty reduction interventions and discuss their interest in a capacity strengthening programme to enhance the use of poverty analysis in the formulation multi-sectoral strategies to reach Sustainable Development Goals (SDGs) 1 and 2. This programme is part of a year-long agreement between the FAO and the IPC-IG, which includes the development of a comprehensive training programme to be adapted and implemented in Morocco and Panama by the end of 2018.